I’ll never forget falling in love with Thai food. My first experience was eating it with my best friend in a tiny basement restaurant. She had started college a few months before, and I was visiting her from high school. She had discovered so many new foods in her first months away from home and was eager to share them with me. From the first bite, I was hooked. I loved the creamy, spicy curries and all the peanut sauces. Back then, I’d never had cider; pairings were the furthest thing from my mind. As the years have passed, I’ve only learned to adore Thai food more and to pair it with cider frequently. Back when I worked in a tasting room, we often made our after-work hangouts into informal pairing parties at a BYOB Thai restaurant. 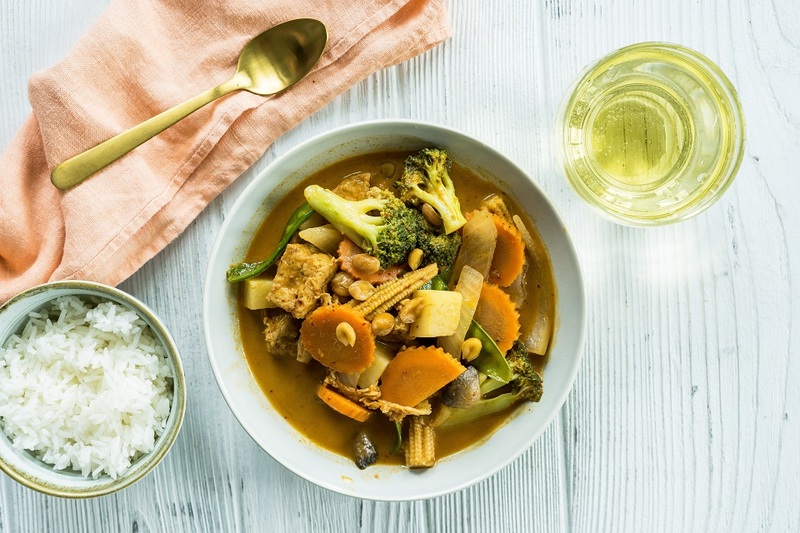 It’s the acidity and presence of fruit that make cider such a natural pairing for Thai food. Read on and explore with me! I do want to start with a disclaimer: I’m not from Thailand and I’m not an expert about Thai food. I just love Thai food; what I can offer in this pairing conversation is my cider knowledge and sense of pairing principles. Please, If I’m woefully ignorant, teach me (kindly, please) in the comments. I want to learn! I’ve chosen pairings for several different courses of Thai food, describing a style of cider I think will enhance the dishes, including a few examples that I’ve reviewed and can wholeheartedly recommend. These dishes are a few favorites; the world of Thai food goes so far beyond just what I’m covering here. Let them be the start of your own explorations. There are always so many tempting appetizers on the menu when I visit Thai restaurants. I almost always start with fresh rolls, sometimes called summer rolls. 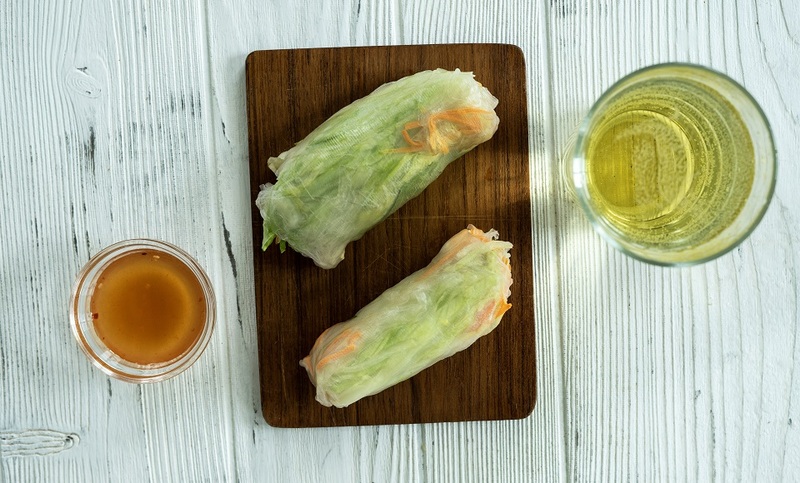 These delights come in a rice paper wrapper stuff with Thai basil, shredded lettuce, cilantro, carrots, bean sprouts, vermicelli noodles and tofu. It’s a balanced meal in miniature, made even better when dipped in either sweet chili or peanut sauce. I want a cider with body and complexity to complement this multi-layered appetizer, so something semi-dry with a hearty dose of tannins is just what I need. I recommend Understood in Motion 3 released by Angry Orchard Cider and created as a collaboration between its head cider maker Ryan Burk and Tom Oliver of Oliver’s Cider and Perry. This cider is partially wild-fermented with a great balance of acidity and tannins. For meat-eaters, start with chicken satay skewers. These salty bites of juicy chicken should be grilled to just the right level of crispy outside and tender inside, and served with cucumbers and more peanut sauce for dipping. This is usually a fairly mild dish, so it’s approachable for someone new to Thai food. Since it’s not too spicy, try a cider that balances spice and sweetness like Blake’s Hard Cider’s El Chavo. This cider uses pepper and mango, but it keeps the heat under control, while keeping just enough to add flavor and interest. There are countless Thai curries, but my favorite is the massaman curry. I like it sweet and spicy with big bites of potatoes, pineapple and tofu, in a rich sauce of peanuts, coconut milk and spices. While pineapple may not be a universal choice, it’s how I learned to love this curry, and I’ll happily pair it with Redbyrd Orchard Cider’s Starblossom. This cider is partially aged in barrels, giving it a more substantial mouthfeel. I want a cider that’s dry and structured to accompany a creamy curry, but it needs to have some heft. The barrel aging and slightly higher ABV in Starblossom add up to a perfect curry-friendly cider. In addition to curries, noodles are an important component of Thai cuisine. Pad Kee Mao, sometimes called “Drunken Noodle,” is a dish of wide, flat noodles stir-fried with garlic and chili with Thai basil, baby corn, carrots and mushrooms. Again, this can go from being a little bit spicy to roaringly hot. If you go spicy, choose a still cider. 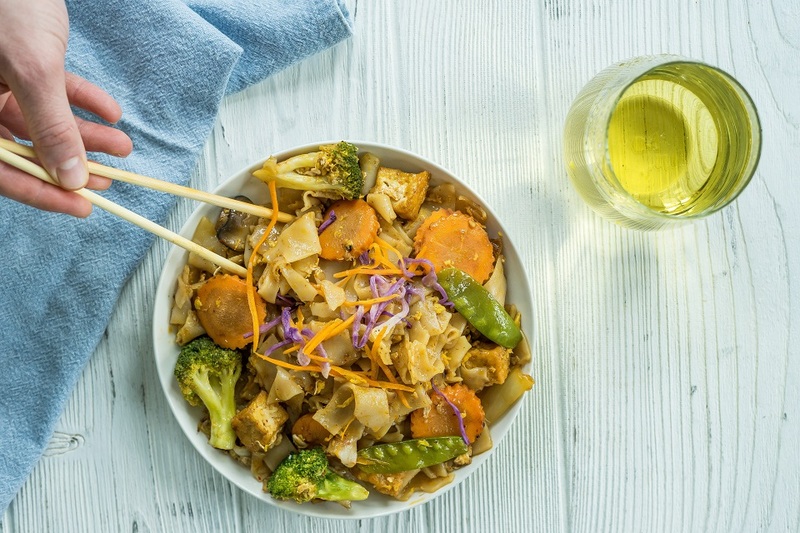 Bubbles can rev up the perception of spice, so I recommend a totally still cider to pair with Pad Kee Mao. Look for a cider with lots of flavor, ideally structured, but not too much acidity to go out of balance. Aeppeltreow’s Americana fits the bill perfectly. This is another cider where apple choices make all the difference; in this case, historical apples are chosen to recreate the experience of Colonial American cider. I love this cider’s soft tannins, and they really shine when counterbalancing something spicy. Khao Tom Mud: This dessert blows my mind. The combination of sticky rice, coconut milk, sugar and sweet black beans becomes more than the sum of its parts when candied in a banana leaf. Pairing cider with a sweet and flavorful dessert like this can be challenging. Sometimes dry ciders just seem bitter next to a sweet dessert, but there are some delicious dessert ciders. I recommend Liberty Ciderworks Manchurian Crabapple. Do notice the higher ABV of 12.5% and serve a smaller pour, accordingly. You won’t need too much, as this semi-sweet cider packs a wallop of flavor. I love the crab-apple characteristics of high acidity and high tannins. Enjoy all of your cider and Thai food pairing adventures! There’s an amazing breadth of possibilities out there, and so many of them are thrillingly delicious.